Former Labour Party leader, Ed Miliband, has hit out after Prime Minister Theresa May’s announcement of a university tuition fees review, telling JMU Journalism he doesn’t believe she can deliver essential changes. 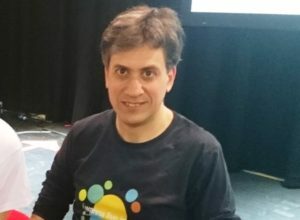 Speaking after a live recording of his ‘Reasons to be Cheerful’ podcast, which was held in the University of Liverpool’s Mountford Hall, Mr Miliband backed the current Labour policy of abolishing fees and bringing back maintenance grants. On Monday, Mrs May revealed that a year-long review into university funding will be chaired by the author and financier, Philip Augar. In an interview on ITV’s This Morning programme, the PM ruled out scrapping fees, saying students “who benefit directly from higher education should contribute directly towards the cost of it”. 1998 – Tony Blair’s Labour Government introduces higher education tuition fees at up to £1,000 per year across UK. Devolution leads to separate arrangements in Scotland, Wales and Northern Ireland. 2004 – Labour brings in legislation to allow universities in England to set their own fees up to a cap of £3,000 a year. 2010 – Lib Dems pledge to axe tuition fees in General Election manifesto, but then enter Coalition Government with Conservatives and cap rises to £9,000. 2015 – Conservative Budget reveals fees will go up in line with inflation from 2017-18 academic year onwards. 2017 – Labour gives General Election promise to scrap tuition fees and issue is seen as influential as the Tories lose their overall majority in Parliament. 2018 – PM Theresa May announces review into fees system, but rules out abolishing them. In response, Miliband said the current situation whereby students in England now pay in excess of £9,000 a year is a problem of her party’s own making. He told JMU Journalism: “I think that it’s very illuminating that seven or nearly eight years after the Conservatives came to power, Theresa May is trying to tear up her own policy – because it’s not working. Mr Miliband, who resigned as Labour leader after losing the 2015 General Election, suggested arguments he advanced “about the fact people have been loaded down with huge debt” have been proved right, but “the Conservatives resisted them year after year”. The MP for Doncaster North backed his successor, telling JMU Journalism: “Jeremy Corbyn has shown the way this can be paid for. “It’s a bold stance and I think she [Mrs May] is nibbling around the edges. From what I’ve read, it doesn’t sound like it’s going to be fundamental to the situation. When the guidelines were set for the current cost of tuition fees during the Coalition Government of 2010, the £9,000 threshold was recommended as a maximum cost. However, the variable rates that had been anticipated did not come to fruition, with the majority of university courses opting to charge the full amount when they were first introduced. Miliband told JMU Journalism: “I had a more modest version of what Jeremy proposed in 2015, but one of the things I resisted was the idea that you should charge more for one course than another. You can immediately see the problem with it. “Why would you be charging scientists and engineers more than arts students? Where is that going to get you? At the weekend, Conservative Education Secretary, Damian Hinds, told the BBC’s Andrew Marr programme: “What we need to look at is the different aspects of pricing – the cost that it is to put on the course, the value that it is to the student and also the value to our society as a whole and to our economy for the future.